How many swim practices should my daughter do? My 6 year old daughters are on the local swim club. It is the “seed” program for our local high school. We have not graduated any Olympians, over the years a handful of students have gone on to swim in college, we can place at states but I am not aware of any state titles. My goal is for my daughters to learn to swim well and be part of a team (and everything that comes with competing with a team). I want them to enjoy swimming for life and to be able to experience other activities. Can you recommend a resource that would discuss appropriate length and number of practices (for different age groups) that allows for balance and avoidance of burnout ? I would also welcome your personal thoughts. The goals that you outline for your daughter below are really responsible and fit perfectly with why young children should be swimming – including learning to swim well, be safe in the water, become fit and healthy and to be part of a team. 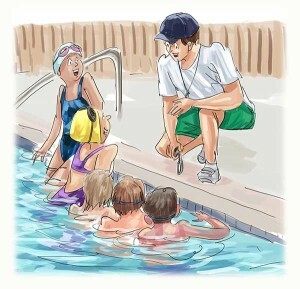 The primary resource for swimming parents is the book Swimming for Parents. The book discusses the appropriate length and number of practices for different age groups and the different things that need to be taken into consideration when determining how many sessions a young swimmer should be doing. It also discusses many other aspects of being a swimming parent. Doing other activities, particularly at such a young age is critical for their athletic and social development. Multiple sports or activities should be carried through into their teenage years. I see burnout a bit differently to some. To me, burnout is often talked about when someone chooses to finish up in a sport. Often these athletes have trained a lot at an early age or been an early developer and have decided not to continue for whatever reason. In most cases this reason is because they are not improving at all or at a fast enough rate whereby the athlete still enjoys the hard work they put into the sport, but the results just aren’t there. The other most common scenario is when an athlete just no longer enjoys the training or competition component of a sport and they decide to either try or continue in a different sport or focus on schooling or other activities. Often these athletes are still improving rapidly but the enjoyment has gone. Both of these scenarios are often referred to as “burnout” however I am not sure whether the decision to discontinue is often based around enjoyment and improvement levels. How to Pace 200m and 400m Events?